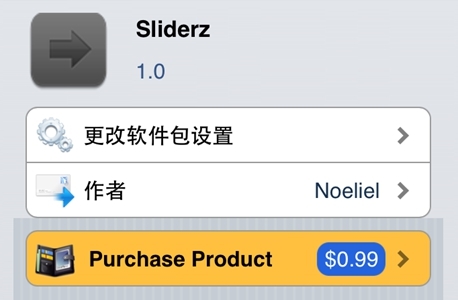 There is another application available in Jailbreak market that is Sliderz released by Noeliel. In this new Jailbreak they allow user to add Emoji elements and whatever you want to write and texts to the various sliders in iOS, Such as slide to unlock slider, power down slider, Notification slider and the calling slider and much more. After doing that your slider seems more bright and attractive. Every software has compatible with any OS so sliderz compatible with iOS 6x on iPhone, iPod touch and iPad but not compatible with iOS 4 and iOS 5. Set custom texts to the Unlock Slider, Power Off Slider, Incoming Call Slider and Bulletin Sliders! Right away changes! No need to respring! If you want to download Slizerz 1.0, it’s now available at Cydia BigBoss repo for $0.99. After setting up, Sliderz would insert a preferences panel to the Configurations app for you modifying the text for any slider you needed. As opposed to competing tweaks, one of the remarkable things regarding Sliderz is that you won’t really need to respiring the device for variations to take effect, simply because alterations usually take effect right away.